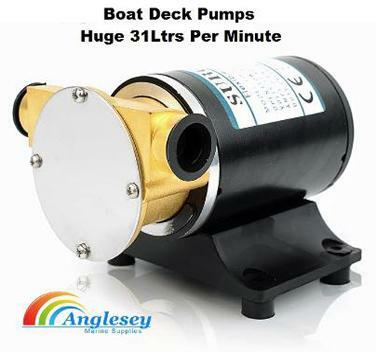 Anglesey Marine Supplies....Cost effective boat bilge pumps and boat water pumps, boat toilets, hand operated bilge pumps and electrical 12v bilge pumps, We supply Rule And Attwood Automatic Bilge Pumps, Large Capacity Boat Bilge Pumps, Boat And Marine Plumbing Fittings, Switch operated or Automatic pumps to suit every pocket. Boat Toilets and Portable toilets-portapotties etc for complete boat and yacht sanitation. We also supply hose, fittings and macerator and water pumps. 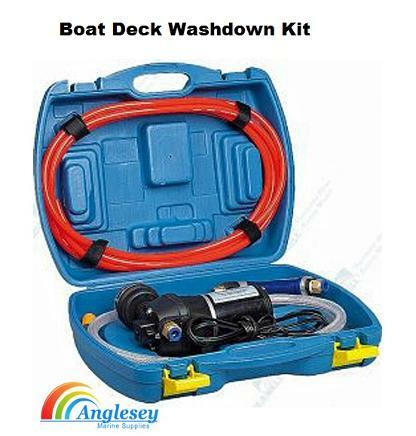 Now supplied new for this year the complete boat washdown kit, easy and effective to use.Recently added boat drain skin fittings, self draining scuppers and self draining scuppers for ribs and inflatable boats. Please use drop down bar for gallons per hour choice options. Attwood premium range automatic bilge pump with 19mm connectors. The Attwood Sahara is available in 500, 1500 and 1800 gallon per hour capacity. 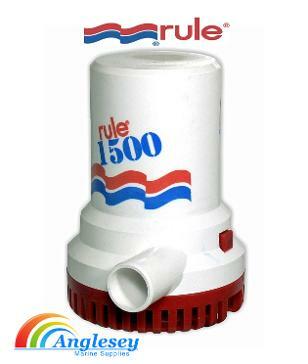 Top Quality Rule boat bilge pumps available in either 360 or 500 gallons per hour flow rate. On the drop down menu GPH=gallons per hour flow rate. 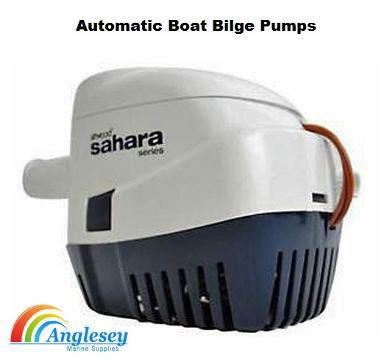 The Rule 1100 is a high capacity boat bilge pump suitable for small and medium sized craft. Compact tough and totally sealed this unit incorporates all the fully automatic features of the larger pumps and offers maintenance free operation. Suitable for hose diameter 28mm ID. 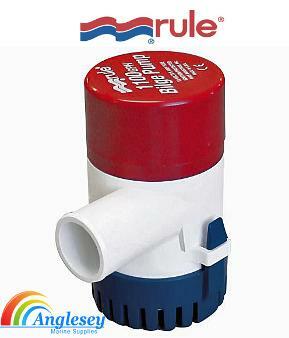 Rule Boat Bilge Pump 800 and 1100 gallons per hour flow rate quality water pumps with 19mm and 25mm hose connections. 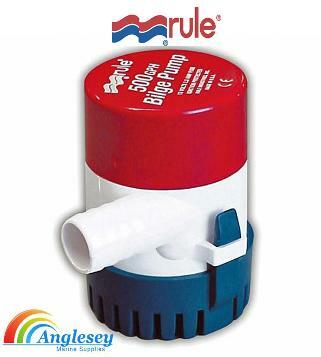 Rule top quality boat bilge pump with a 1500 gph pumping capacity-19mm connection. 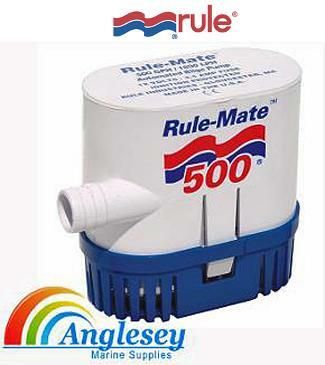 Premium Quality Rule 500 gallon per hour pumping capacity rule automatic bilge pump fitted with a 19mm hose connection. 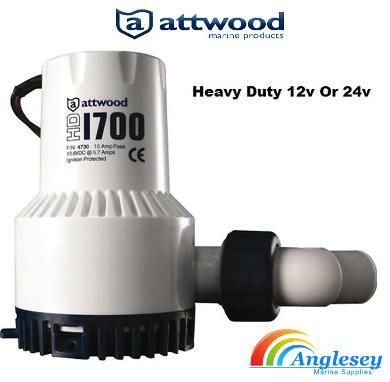 Heavy duty Attwood 1700 boat bilge pump designed for punishing applications particularly in commercial work. Large filter prevents clogging. Available in flows 1700 and 2000 gallons per hour and also in 12 volt or 24 volt. 1" hose connection. Functions: This high pressure boat deck wash down kit washer can either be used to clean boats, motorhomes or cars with a 12VDC battery as cigarette ignition battery in cars. It can also be used to clean motorcycles, air-conditioners, outside walls, bathtubs, toilets and any other place where is hard for you to clean. It is also applicable for sterilizing of food processing place or machinery, hotel kitchens or restaurants as well as irrigation of trees, grass and flowers. Includes hose, 85 PSI spray gun, pressure pump, filter, carry case. 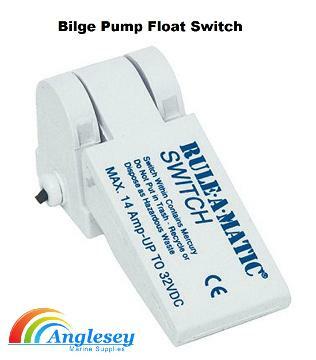 Economy boat bilge pump float switch for operation of non automatic boat bilge pumps. 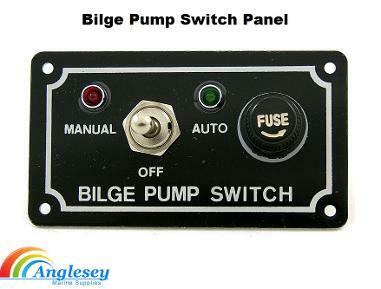 Bilge Pump switch panel, ideal for manual or automatic operation. Can be used with a boat bilge pump float switch, c/w fuse. 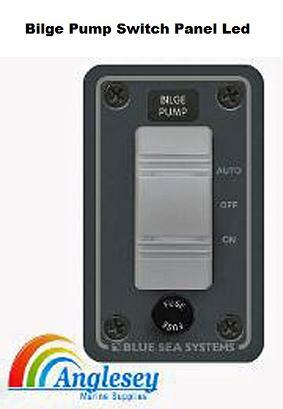 Led Bilge Pump switch panel, ideal for manual or automatic operation. Can be used with a float switch, c/w fuse. Waterproof. 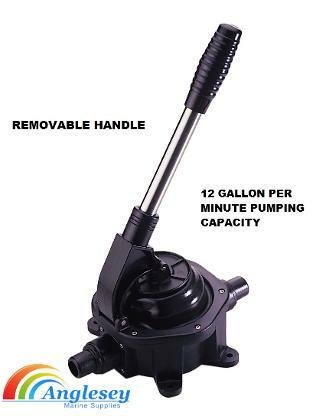 Deluxe hand operated manual hand bilge pump for small boats. 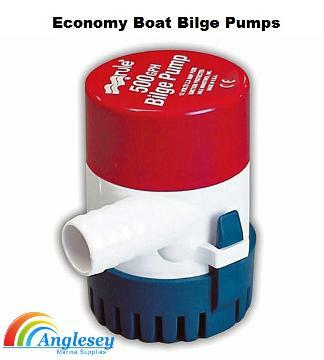 The hand bilge pump has a pumping capacity of 12 gallons per minute (54lt) Approx 1.5lt per stroke. 25mm hose connection. The hand bilge pump Has a detachable stainless steel handle when not in use. Kayak manual bilge pump. Hand operated bilge pump. 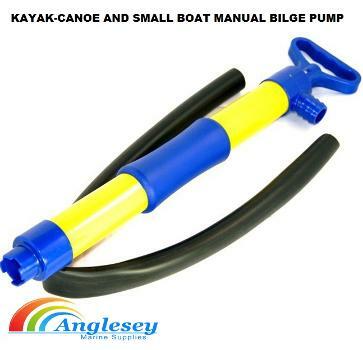 Totally portable manual hand operated boat, kayak, canoe and inflatable boat bilge pump. Non corrosion construction. Comes with a length of hose. 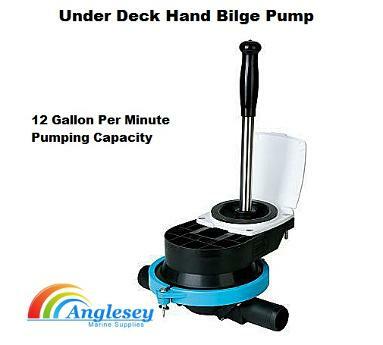 Under deck mounted manually operated hand bilge pump same supplied with deck plate. A large hand bilge pump, with capacity of 12 gallons per minute (54 litres). Has a marine grade 316 stainless steel detachable handle. 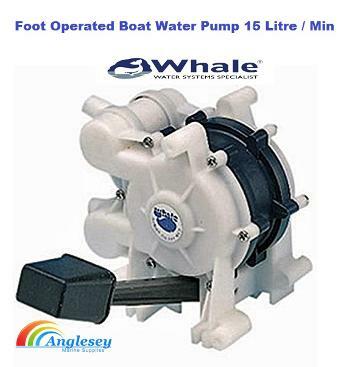 Whale foot operated boat water pump, ideal for use in boats, caravans and motor homes. Will pump 8 litres per minute, fits 12-13mm hose. 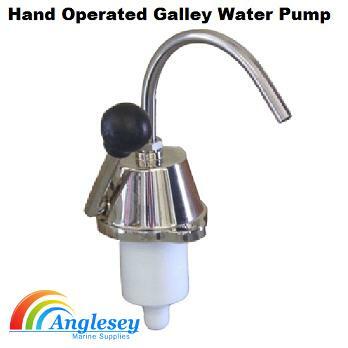 Hand operated boat galley water pump, which is fitted with a prime lock feature, which means water is immediately available on the first stroke of the pump. Chrome finish. Fitted in boat galleys, also can be used in caravan and motorhomes. 12 volt boat galley water pump and tap, switch and pump. Delivers 6.6 litres of water per minute at 2 metres head height. l2mm hose connection. Ideal for boat cabins, caravans, motor-homes, horse-boxes. Manually foot operated boat water pump whale gusher boat cabin Foot-pump / water pump. Will pump 15 litres of water per min. Inlet and outlet connection using a 12-13 mm hose. 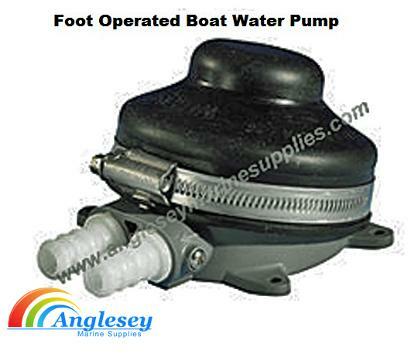 A quality foot operated water pump, ideal for boats, caravans and motorhomes. 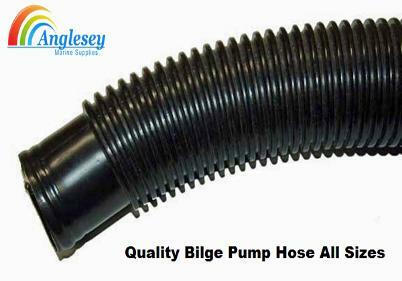 Extremely flexible and tough corrugated boat bilge pump hose. Cuffed every 12" (300mm) for easy clamping. 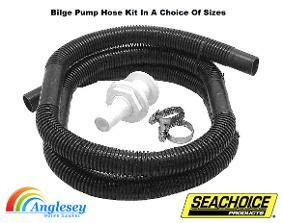 Seachoice boat bilge pump hose fitting kit & fittings Installation kits 6 feet long hose length ( 1.8 metres ) flexible corrugated hose, comes complete with stainless steel 316 hose clamps and skin fittings. Choice between either 19mm (3/4") installation kit or the 26mm (1") installation kit. 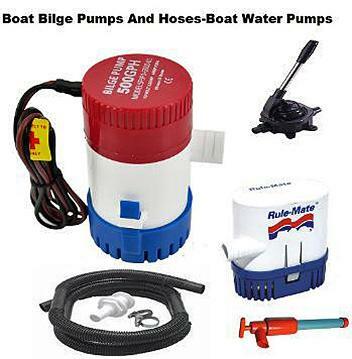 An easy way to connect your bilge pump to your boat. 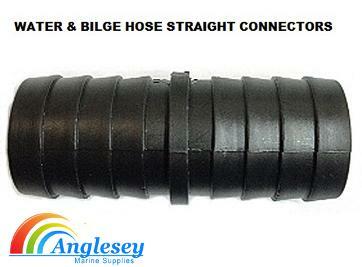 Quality reinforced pvc clear hose, perfect for water and boat bilge pump applications. Available in different sizes to fit most pumps. Please choose hose dimension required from drop menu and then enter metres required as quantity. 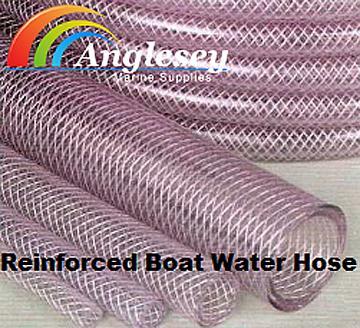 Boat water hose. 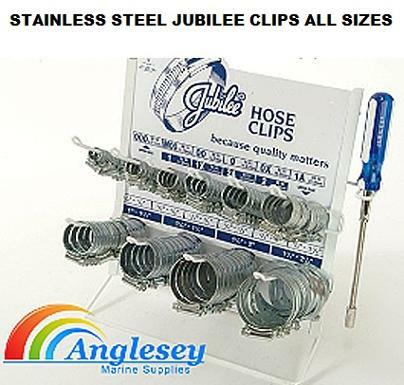 Quality stainless steel Jubilee Clips, manufactured to British Standard 5315. Available in a variety of sizes from 9.5mm to 100mm. 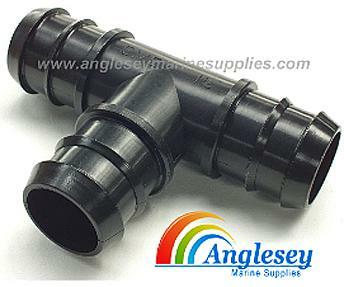 Perfect for all marine hoses, bilge pumps, boat water tanks. 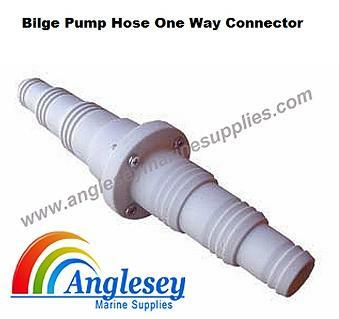 Water hose bilge pump hose straight connector, available in sizes 1/2" 12mm, 3/4" 19mm, or 1" 25mm. Water hose bilge pump hose y connector y section manufactured from durable plastic, 1/2" 12mm in diameter. Water hose bilge pump hose elbow connector elbow, 1/2" 12mm in diameter, manufactured from durable plastic. 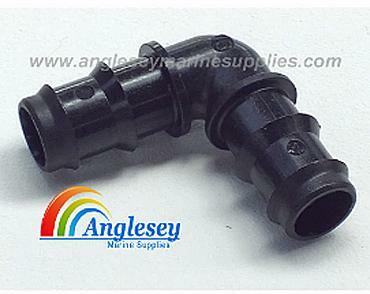 Water hose bilge pump hose t connector tee section, manufactured from durable plastic, available in diameters of 1/2" 12mm, 3/4" 19mm, 1" 25mm. 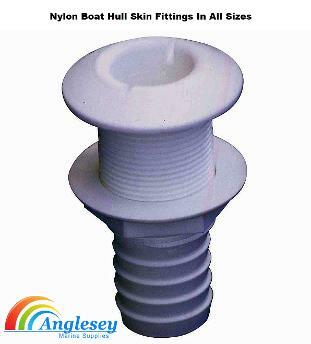 Nylon boat hull skin fitting for connection of bilge pump outlets etc. Available in diameters of 12mm, 19mm, 25mm, 38mm. 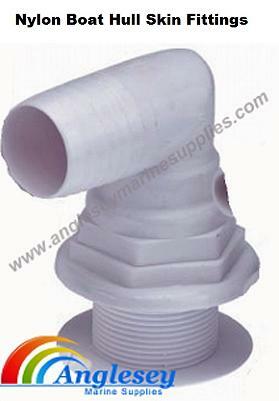 Nylon boat hull skin fitting 90 degrees, used for bilge pump outlets etc. Available in diameters of 12mm, 19mm, 25mm, 38mm. 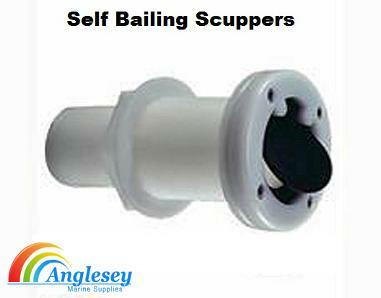 Thru-hull self bailing scupper with nut is used for mounting through the transom, large self bailing boat scupper, manufactured from hard wearing nylon, fitted with a 38mm barb to take an hose or use as a self standing transom bailer. 90mm of thread, overall length of 155mm. 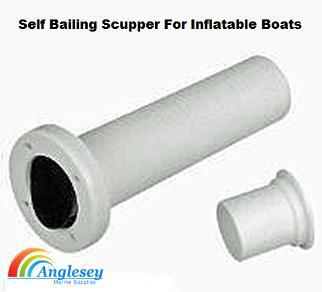 Inflatable boat self bailing-scupper, large 40mm diameter, can be cut to fit different boat transoms. Rubber flap allows one way flow. Bung also available. 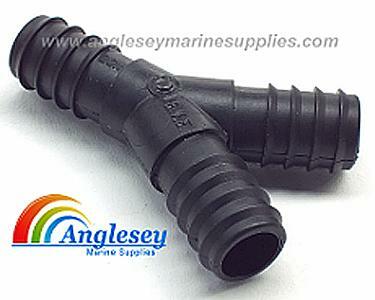 Suitable for Ribs and Inflatable boats. 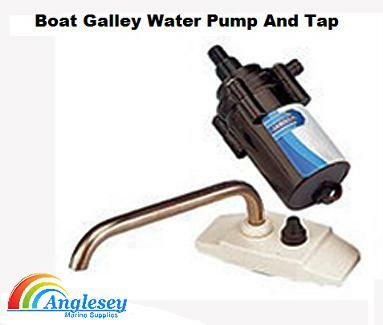 Anglesey Marine Supplies as a selection of fresh and saltwater boat water pumps available to suit all needs. These pumps are self priming and have built in pressure switches to start and stop when the faucet is opened and closed. Will run dry without damage. 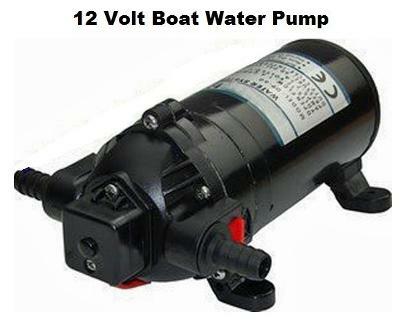 Splashproof 12V boat water pump with a max flow of 100psi. Open flow of 4.3 Litres per minute. Pressure on/off is 35 psi. Has a 1.9 amp draw at 10psi (0.7 bar). Will supply up to 3 fixtures. Uses 3/8" barbs. Ideal for Boats, Caravans and Motorhomes. Also Canal and Narrowboats. 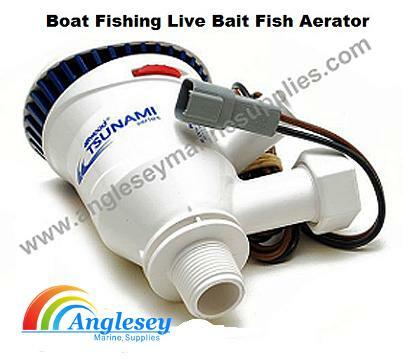 Boat Fishing Live Bait Fish aerator pump for live bait circulation. Keeps the water rich in oxygen. Feeds an aerator spray head and can be used even when under way when you cannot use a thru-hull connection. Can also be used as a back up bilge pump. 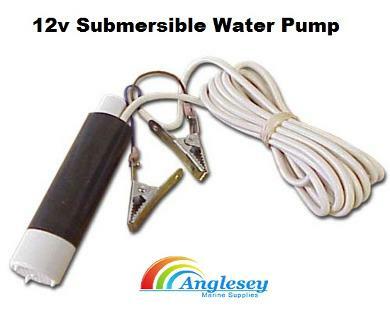 12v Submersible boat water pump for boat, caravan or motor-home water pump Has a flow rate of 8 litres per minute. Boat deck wash water pump , quality boat water pump, manufactured from brass. Has a 30 litre per minute pump capacity. The boat deck wash pump as 25mm connections. Power consumption is 8 amps at 12v. A quality boat deck wash pump, water cooling pump. 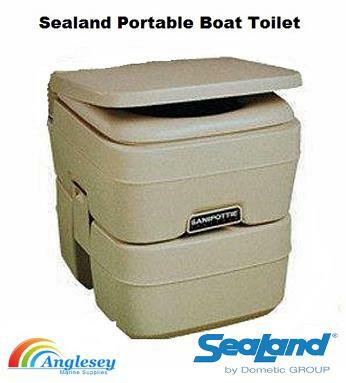 The Sealand Sanipottie chemical portable boat toilet is like having the convenience of your home on your boat. Compact tanks provide the maximum capacity using the minimum amount of space. Available in two sizes, 10 L, 20L, Tanks. 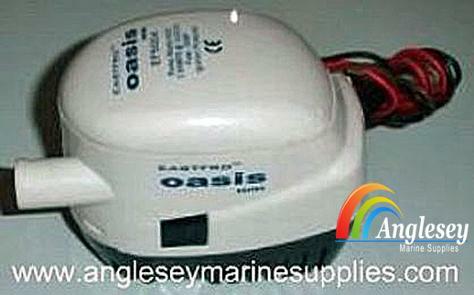 Ideal for Boats, Caravans, Motorhomes and Camping. Useful for canal and narrowboats also. 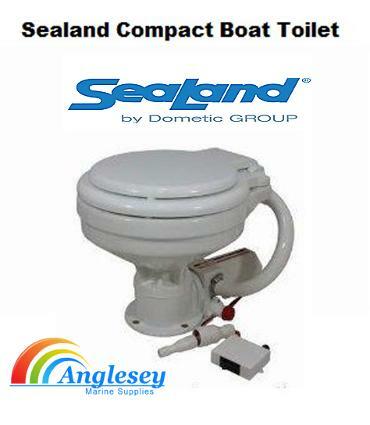 Sealand Compact Boat Toilet special white vitreous china bowl with internal space as a normal wc. A diaphragm easy to use hand pump avoids clogging problems. The compact design enables easy fitting into compact spaces. All metal parts are stainless steel for maximum corrosion protection. Can be installed above or below the waterline. Comes fitted with a wooden seat as standard. Size is 350mm x 320mm x 420mm. Inlet 19mm. Outlet 38mm. 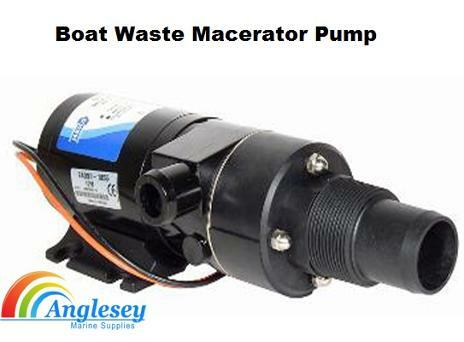 Boat toilet macerator pump with 45 minute rated motor. Can discharge tanks up to 2100 ltrs in one operation. Uses a bronze macerator then is pumped away using a flexible rubber impeller. Self priming up to 1.2m head height. 47ltrs per minute capacity at 3m. Draws 18 amp at 12 volt. Inlet 38mm or 53mm. Outlet 25mm. 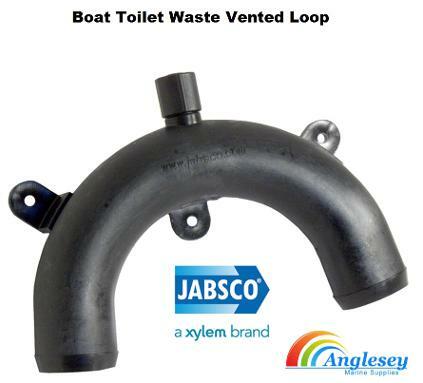 Boat toilet waste vented loop for inlet and discharge for boat toilet waste systems, available in two sizes 19mm and 38mm hose. For installation below the waterline. 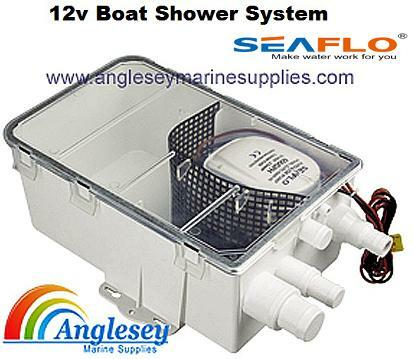 12v Boat shower pump system for use on boats with built in shower or tub. Made from tough, non-corrosive materials. 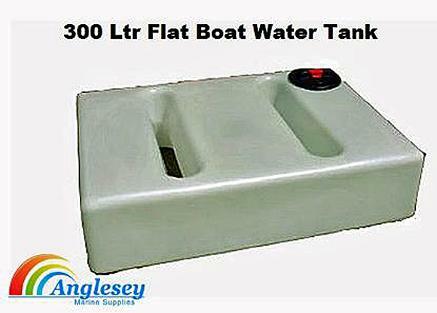 Flexible boat water tank, also ideal for caravans, camping and motor-homes. Available in a variety of sizes. Economical and easy to install. Will assume the shape of the space where fitted. 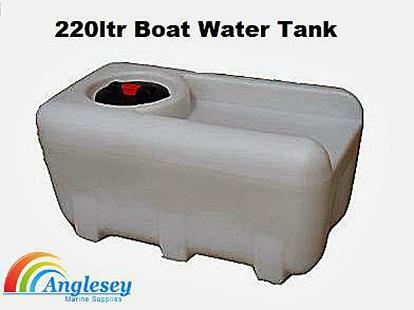 220ltr Boat water tank boat water tanks. Made from MDPE strong and robust. Recess for a pump on the top, Comes with lid with rubber.seal Comes with Hoselock compatible tap., requires a 27mm hole drilling to suit. Dimension 57cm wide x 50cm high x 105cm long. Available in black or white. 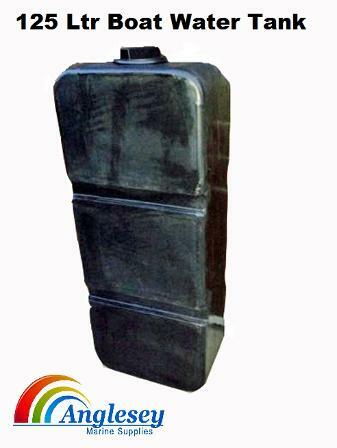 100ltr boat water tank made MDPE, strong and robust with a 3-4mm wall thickness. The boat water tank is fitted with a sump for easy draining and a recess on the underside for a pump, Moulded in brass inserts, 1 x 3/4 BSP " and 1 x 1/2 BSP " brass fitting for outlets etc. Comes with Hoselock compatible tap. Sizes are 80cm long x 34cm wide and 51cm high, the boat water tanks is available with or without fixed down frame. 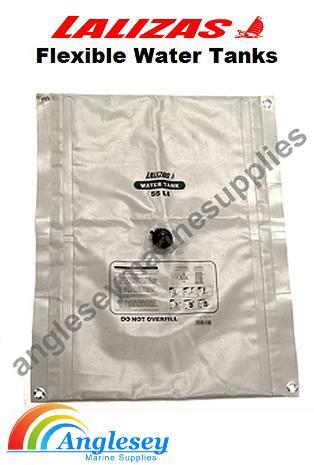 125L BOAT WATER TANK-BOAT WATER TANKS MADE FROM ROBUST POLYETHYLENE. MANUFACTURED BY OURSELVES IN OUR FACTORY IN CAMBRIDGESHIRE. SLIM PROFILE, IDEAL FOR SMALL VANS. DIMENSIONS ARE: FLAT TANK 450MM HIGH X 280MM DEEP AND 1115MM LONG. VERTICAL TANK 1115MM HIGH X 280MM DEEP X 450MM WIDE. COMES WITH 4" SEALED LID AND HOSELOCK COMPATIBLE TAP.OUTLET WILL NEED DRILLING TO SUIT BUYERS POSITION. 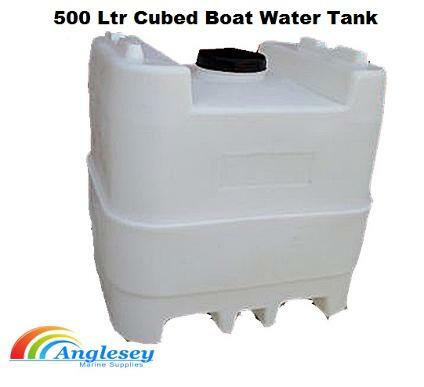 350 Ltr flat boat water tank-Boat water tanks made from 25kgs MDPE Baffled tank, ideal for boats, motorhomes, vans, pick-up and trailers. Comes with Hoselock compatible tap. requires 26mm hole drilling to suit buyer tap location. The boat water tank sizes are 1350mm long x 330mm high x 970mm wide. Large 8" vented lid with rubber seal. 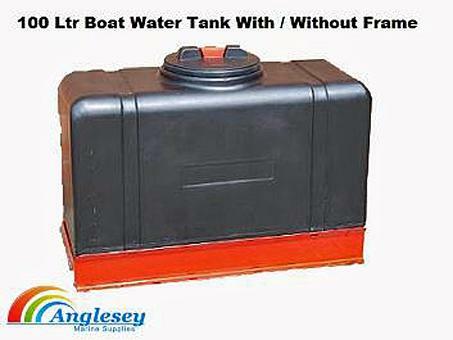 500 ltr boat water tank-boat water tanks moulded from 25kgs of MDPE in a wide range of colours. Sizes are 91cm high x 90cm wide x 75cm deep. Stackable with interlocking feature. Recess for tap with moulded in 3/4" BSP brass insert. Comes with Hoselock compatible tap. Slots in base for forklift tines. Available in black or white. Hoses,Clips, fittings to be added shortly. If in the meantime their is anything not shown you require then please contact us.